After living around the world, Liz Galloway now has a hyper-local focus. Since early this year, Galloway has been the director of marketing for Merco Local, founded in 2013 by Don Hamp to support local businesses—which are close to Galloway's heart, as she was born and raised in downtown Salt Lake City. 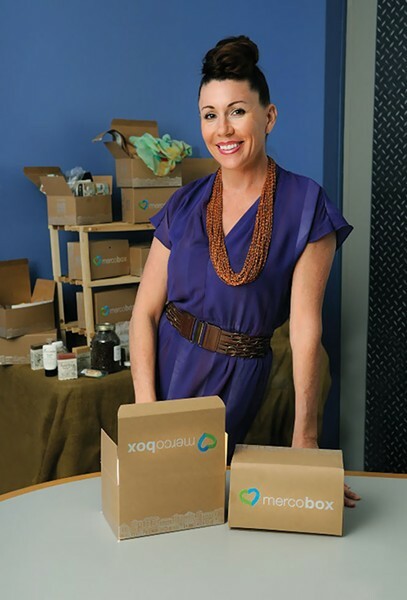 Merco's local-first focus is embodied in several ways, including it being frowned upon for employees to bring any non-local goods to the office, but it's made the most waves with the Merco Box, a monthly subscription box that contains samples and gift certificates from local businesses and restaurants. Merco is celebrating its anniversary and the opening of its new storefront in Holladay (4659 S. 2300 East, No. 203) with a Sept. 20 event at the store from 6 to 9:30 p.m., featuring pop-up art, live local music, food, drinks, raffles and more. Visit MercoBox.com for more information. Do consumers miss out on anything by shopping at, say, Target? You go into a local store, and you talk to the shop owner—they're usually there, all the time—and then you have a new friend. And then you go back and become a loyal personal. Partnerships build that way, inspirations are formed. Another thing is the uniqueness of it. You're not going to find a really cool piece of jewelry that's unique to you at Target. You're just going to look like everybody else. I think you just lose out on something that's very experiential that can't be replaced by big-box stores. Is Utah's local-business culture different from other places? I think it's a unique market because it's very supportive of other businesses. There's a lot of alternative art and things growing here, so people are really supportive and excited to help each other. What was the founding principle of Merco Local? A one-stop platform for local businesses to get their information out there. The CEO, Don, is really passionate about what he's doing; he's putting everything on the line to do a startup supporting local businesses. We are a local business, we are a small business, so we understand that whole mentality. [Local businesses] have an online profile that they create, with an accessible background where they can put coupons, they have a blog that they can control, direct-e-mail campaigns, SMS messaging. They also have our support—if they don't have time to manage the back end, we'll do it for them. We also try to source and find things that are unique and different. Why'd you start a subscription box? It's another venue for the merchants that we support to get out to people in the market. Subscription boxes are pretty popular right now. It goes right to their doors—it's one thing to get a gift card or see something online, but to have it actually delivered to your door ... And this is your local—every time you purchase this, you have something that's going back into the local community. We also have subscribers from out of state, who've moved away but want a little something from their community. What's in a Merco Box? It varies every month what's in there—it's kind of like a surprise. If you don't have all the time to find out everything that's going on, we're your source for that—we let you know the people who are out there with cool stuff. We find new businesses every single month, so it's a constant "Who's out there, who's doing what?" Some people we'll find working in their homes and selling on Etsy, and we highlight them in the box. We work with a lot of restaurants that are locally owned and operated that do gift cards. And we're going to have a retail space where people can actually walk in and see and touch the boxes, and do some build-a-box options. What's your favorite local store? The one off the top of my head is Q Clothing. Everyone loves them. She has really cool stuff in there. Zest—food, music, DJs. It changes a lot, when I find out about new stuff.